Maintaining and installing quality gutters on a commercial building can be a small investment that will prevent big problems from surfacing. Water damage is one of the leading natural causes of property loss for businesses, and quality, rigid commercial gutters can help curb this type of damage by keeping runoff away from the building. Many business owners think of a leaky roof as the main cause of water damage inside of a building, but a leaky roof is obvious, and often quickly repaired. Clogged and strained gutters, on the other hand, may go unnoticed for months or even years. As additional debris collects inside of the frames and downspouts, water trickles off of the roof directly onto the ground next to the building. Commercial foundations are built to withstand a lot of natural elements, but concrete absorbs water like a sponge and then passes it on to the materials inside. This can cause a variety of problems including dry rot, mold growth and ruined flooring. Water damage in a home can be annoying or even heartbreaking, but water damage in a business is more than that. In addition to the property that’s destroyed, there is often damaged inventory, increased cost of repairs for commercial materials, and lost profit for business closures to consider. Quality gutters can prevent these problems. Most business owners don’t have to think about their gutters often, and that’s a good thing. A professional roofing company can easily make repairs to gutters, downspouts and nearby materials that need fixing. 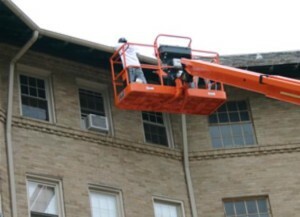 They can also clean the gutters regularly to ensure their continued operation and durability. Just like with a car, more frequent maintenance of gutters can often mean a reduction in future costs by expanding the lifespan of the gutters and preventing more major problems from surfacing. 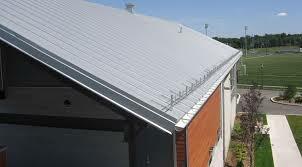 There are a variety of gutter types and styles to meet the needs of any size and design of commercial building. The most common and durable type are galvanized stainless steel, coming in 4”, 6” and even 8” widths for commercial applications. This material provides long-lasting performance and corrosion resistance to keep working strong throughout the winter. This type of gutter can be seamless up to 26 feet to improve water flow and maintain a fluid appearance on the side of the building. Many colors are available including white, black, and all shades of grays and brown. A professional roofing and gutters installation company can advise a business of the best types and sizes of gutters to install for their exact situation, and no two buildings are the same. In states with higher humidity and rainfall like Florida, good gutters and proper maintenance are even more important. The water in the air combines with the leaves to create a sludge in the gutters that becomes difficult to clean and corrodes the metal much more readily. Statistically the majority of insurance claims for commercial properties are for Gutters Columbus Ohio, Gutters Orlando, Gutters San Antonio and Gutters Houston. No matter what kind of environment a commercial building resides in, a good commercial gutters system is critical to the continued integrity and safety of the building.